Holiday glamping and lodge accommodation also ideal for groups (Schools etc) amidst nature in west mid wales. 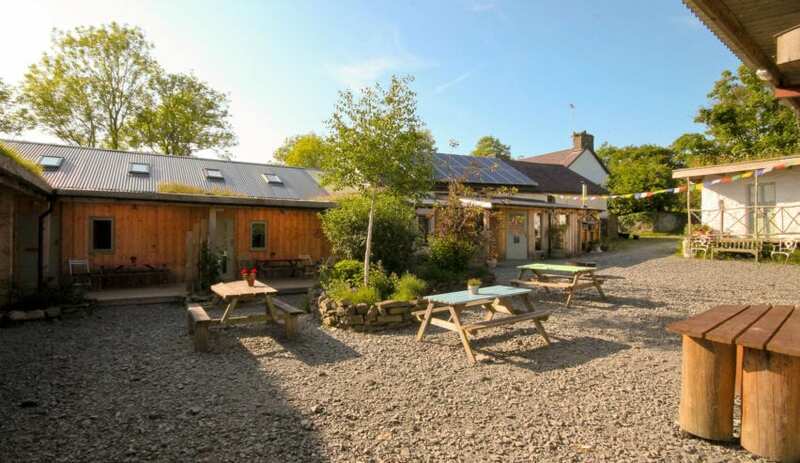 Naturesbase, 10 mins from the Welsh coast at Aberaeron, is surrounded by 9 acres of flower rich meadows and woodland, with a meandering stream and wild hedgerows. For seven weeks of summer this natural Welsh haven offers family accommodation in 3 wooden lodges, glamping in a Shepherds Hut and camping in private pitches. Group accommodation is available for the rest of the year. Naturesbase also specialises in school trips. The 3 family summer lodges sleep 6, 6 and 16 in hand made beds with fluffy duvets. There are timber floors and beautiful bathrooms and the living space spills out onto the veranda where cooking facility are sheltered under the turf roof. The luxurious shepherds hut can accommodate 2 adults and two children and has a double bunk bed with fluffy duvets, a wood burning stove, spacious seating and a well equipped alfresco kitchen. There are ten individual camping pitches with flowers and trees between and a fire pit on each. 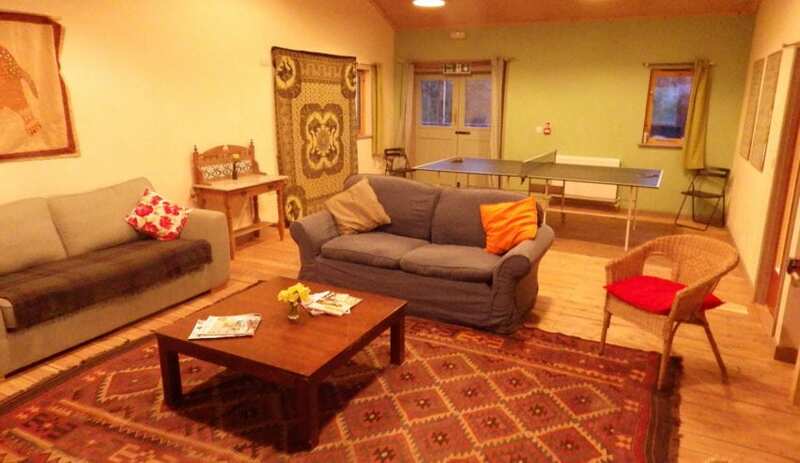 Group accommodation in the lodges can accommodate up to 36 people in 10 rooms outside of the summer season. There is a fully equipped kitchen, a dining room with seating up to 40 and 2 sitting rooms and an outside play barn with a sitting room in the barn. 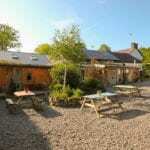 The barn and showers are heated by a wood fuel boiler and duvets are provided. Nestled between the Cambrian mountains and Cardigan Bay Naturesbase is rural and relaxing. Enjoy the open countryside and nature in the day and spend the evenings with stories, conversation, fires and star gazing. . This accommodation is featured on our map of South Wales and Pembrokeshire and here is its own website. Group Accom. 36:4x2, 4x4, 2x6. Summer Lodges:16:4x4, 6:1x6, 6:1x6. Shepherds hut: 2+2 kids. 10 pitches. All year, lodges summer only. Camping from £25 for 2 people. Groups £25pp min 2 night, min 12 people. Lodges from £525 per week. Please contact by email or phone. Please refer to Naturebases website. There are about 20 houses with the same post code, about ½ a mile apart, so if you use Sat Nav to find us, the last ½ mile can be tricky! This accommodation allows dogs by arrangement, is by the sea, is available to individuals, is an 'Eco Hostel' and is on the Hostels with Camping map, the ideal for retreats page, the Wedding Venue page and the map of accommodation for school groups. This is a truly natural Welsh haven for you to experience, nestled between the Cambrian mountains and Cardigan Bay. During the summer holidays Naturesbase offers 10 camping pitches and the creatively designed Ty Coed family lodges. At all other times of year you can book the large 16 bed lodge for family gatherings, celebrations and reunions or book exclusive use of the whole site for school groups of up to 40. A place where adults can relax and enjoy the open countryside whilst children enjoy the rugged excitement nature has to offer. Here the days are about fresh air and the evenings are all about stories, star gazing and camp fires.